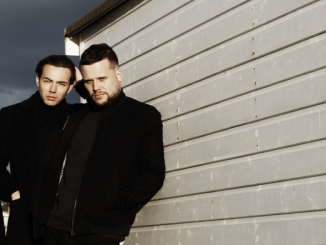 White Lies released their new album, entitled Five on February 1st, 2019 – marking a decade of their existence whilst cementing their new home at [PIAS] Recordings. Five sees the West-London trio scaling new creative heights with re-energised confidence. The landscape has drastically changed over the past decade, contemporaries have come and gone, consumerism constantly evolving but White Lies fans have remained as fervent and committed as ever both in the UK and internationally. The writing and recording process took in both sides of the Atlantic including a creative sojourn to Los Angeles where they worked on new material with old acquaintance Ed Buller – producer of two previous White Lies albums including the band’s chart-topping debut To Lose My Life and third release Big TV. The entire recording and writing process for Five has allowed the band to utilise past associates whilst also using the freedom to create the record they wanted to make. 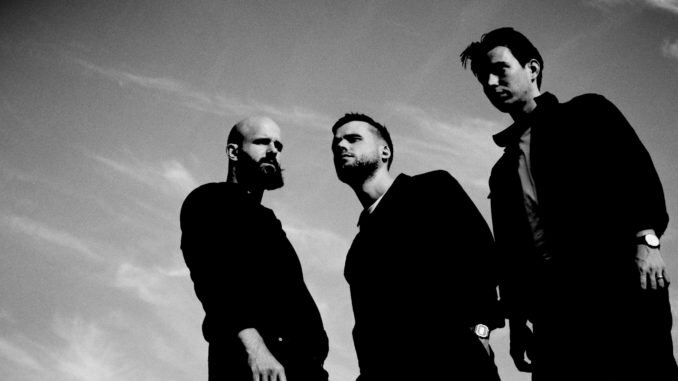 Mark Millar caught up with White Lies’ Harry McVeigh to discuss the new album and tenth-anniversary plans. 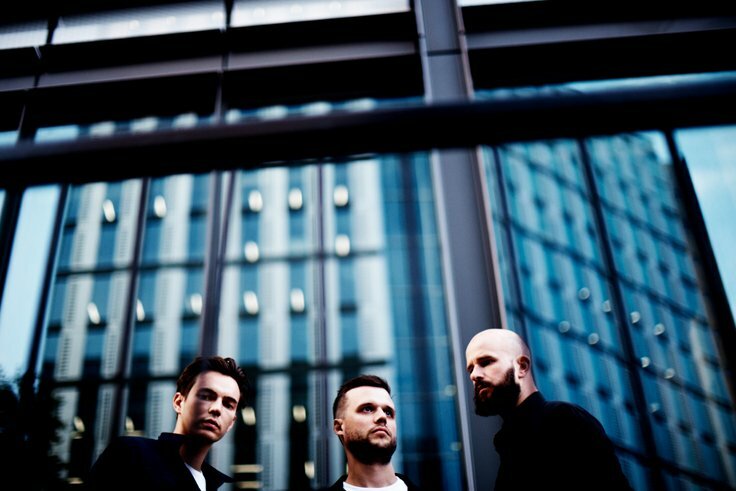 White Lies have released fifth album Five. Did you go into the recording with any preconceived ideas how it would sound and what you wanted to write about? I’m not sure that we did, actually. When Charles and I started writing this album, we approached it like we approach all of our records. We hang out every day – he comes over to my flat, and we sit in a bedroom together and try and write some music. Our aims for the day vary quite a lot depending on what we are listening to at that particular moment. We could be listening to Black Sabbath one day and think we should try and do something like that. It moves what we are aiming to do as the record progresses. Further down the line, the shape of the album starts to take form, and you know where it’s going, and you can make decisions about how you think you might record it and what kind of sound you are going to go for. On listening to the album, I hear some eighties influences on tracks such as ‘Tokyo’ and ‘Never Alone’. Was that intentional? Yeah, with ‘Tokyo’ as we were writing it, I’m sure we had been listening to some cheesy 80s ballads and based the foundation of that song on that. But as soon as we had written the chorus, it was so apparent that it was the sound of that track, and that’s what it needed to sound like. It was the same with ‘Never Alone’ it sounds slightly like Joy Division or New Order. I think very early on we realized it had that groove and we went with it. And I think it’s fun to explore those things when you are writing. ‘Time to Give’ is a great opening track, and it’s a whopping seven minutes long. Why did you decide to put it out first? I feel it was a brave choice to put that track out first. It’s very different to stuff that we have done previously – and certainly the longest song we have ever written. Also, it’s kind of a weird track. It has lots of odd moments in it. While we were recording it, we felt more and more that it was very captivating and interesting and it captures you off guard. We loved it and enjoyed listening to it. So we thought we should try and make it front and centre on the album., That’s why we put it out first and also it’s the first track on the record to give people a wild introduction to the album. ‘Fire and Wings’ is a stunning finale to the album. I love that track. ‘Fire and Wings’ came out of nowhere for us. Often when we are writing albums and doing pre-production work, there are a few songs that don’t make the cut, and that song was right on the edge because it was really strange. We thought it might have sounded a bit like Scott Walker and poppy. But as we were working on it in the studio, it turned into something great. I love when the guitars kick in: they sound so massive and so unexpected. That kind of sound is more akin to a metal record. Charles and I are huge metalheads as well, so we always fancied doing something like that. I’m pleased it worked out, and I think it’s a great closing track on the record. It’s atmospheric and spooky. I love that it ends with the line “All the bravest boys waiting for the world to end.” I think it’s such a great lyric – it’s a great line from Charles. We were thrilled with the way the whole record shaped up and ‘Fire and Wings’ was the perfect end to it. All of our albums before have been ten tracks long, and this one is nine. We tried to put the best in quality that we had on the record. We didn’t put anything on it that we felt we would ever regret. After producing two previous White Lies albums, Ed Buller is back on board in the production chair for Five. Why did you decide to go with him again? Ed has always understood our music better than anyone else, and he’s kind of like a father figure to the band because he helped us make our first album and helped shape what the sound of the band is and what it was going to be. With Ed, he doesn’t necessarily suggest something new to you. On the first album especially he was great at finding the moments in songs we had already written which were unique and typified the sound and the style of the band. And then he helped us to spread that out across the tracks to make it coherent and cohesive. We have always turned to Ed when we want help with the songwriting and structure of our music – he has always been great at that for us. We just got back in touch with him, he is living in LA now, and we spent two weeks there with him shaping the tracks and getting the songwriting spot on. It makes it so much easier when you get in the studio if that’s all in place. Ed is a very eccentric guy, but he’s a great producer in the old school sense of the word. I think it was probably ‘Time to Give’. It was the track that we had least ready when we started working with Ed Buller. I don’t think Charles had even considered that we were going to work on it and I threw it into the mix and said, “Actually, this is pretty good. “ Ed is well into Prog rock, and so are we and he had great ideas about what we could do with that track, especially with the outro on the ending as it ascends bigger and bigger. And so after working on it with Ed, it turned into this different animal. Then we took it to James Brown who engineered the record, and he figured out ways of making the track interesting sonically and also getting the build right at the end which was important. We thought it was a great moment and weird and wonderful. In some ways music should always have a little bit of that I think, and we were thrilled with it. You now live in America. How do you find time to get the band together and be creative when there is a distance between you and the rest of the group? It’s probably harder on my wife she would say. (Laughs) We set ourselves very loose deadlines for the album when we needed it to be recorded by. I basically set aside time with Charles and flew back and spent a month at home and worked in blocks. – It worked well for us we and were able to get it all together. It’s quite nice working on something like that when you are on your own. Having space is great when you are writing – it gives you time in your head. White Lies have been together for ten years with the same lineup. How have you managed to keep going when some of your contemporaries have come and gone? We are really good friends, and we always have been ever since we first started making music together. It was always something we did as an act of friendship and something to do for fun. I suppose that’s part of it we still all individually enjoy it, and we enjoy each others’ company. Going on tour with your best mates is pretty good fun, so it’s easy to carry on doing it. When we first started on the first album, when you’re young, you always think, “This is something I’ll do for a couple of years, and then I’ll get on with having a proper life.” But then that never happened for us. We are so thrilled that we are still going and we are still able to put records out and play shows and for people to still be into it. We love the job, and we have a good time doing it. You will begin touring in 2019. Are you planning anything special for your tenth anniversary? Yes, we are thinking about it and about what kind of show to put on. I think at some point in 2019 there will be shows with us playing our first album in its entirety. That will be fun for us to do and hopefully, it will be a great show and a great nostalgia trip for the people who come and see it and us. Do you have a record that you always return to? I have so many so it will be tough to pick one. Charles and I do have records that we often go back to and listen to while we are writing. One that immediately comes to mind is The Hurting by Tears for Fears. – It has got so many great singles on it and its an immaculately recorded album. That has always been a big record for us. Also, we love Talk Talk, and we listen to Spirit of Eden a lot. We spend an hour or two in the morning when in my kitchen when Charles arrives listening to music and having coffee. And often we will hear something and say, “What they have done on that track is cool, we should try and do something like that.” And then have that moment of inspiration and go upstairs and do some work. I think the new Arctic Monkeys record is phenomenal. I have gone back and listened to it over and over again – which is very unusual for me – I usually only listen to a record once or twice. It’s a bit of a departure for them, and it’s very different from anything they have done before. I’m a big Prog rock fan, and I think it’s an excellent Prog rock record. It takes you on a proper journey. The instrumentation and all the parts are so intricate, and also I think his lyrics and his vocal delivery is incredible – I love that record. I’ve not been a massive fan of him in the past, but I quite like the new Ben Howard record, Noonday Dream. I think it’s a really nice almost ambient rock record. It’s great and it’s recorded well in an interesting way.